She is currently working on a new romance series, titled On The Set. Watch out for release information!! Facebook: facebook.com/a R.L Jackson is an independent filmmaker, magazine editor and screenwriter who writes romance and romantic suspense with an aim for readers to, "Get Lost In Intense Passion and Diverse Worlds." She lives in south Florida enjoys binge-watching Netflix, uses her treadmill as an over-sized coat hanger, but loves to dance to the Fitness Marshall videos on Youtube. R.L. Jackson hasn't written any blog posts yet.
" I’m in too "
" Hi everyone my new book The Craving is LIVE! (Urban Fantasy). Check it out! 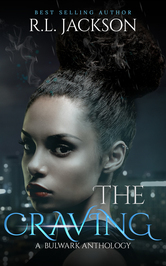 Savannah Daniels is looki Hi everyone my new book The Craving is LIVE! (Urban Fantasy). Check it out! Savannah Daniels is looking forward to spending some alone time with her longtime boyfriend, Marshall. Everything during this fun-filled spring break was moving along fine, until his awkward cousin Stefano, and his equally weird girlfriend, Sheena decide to crash the party. It didn't take a college graduate to realize something was definitely up with these two blood-sucking intruders, and it isn't long before the true intentions about what they are and what they want become clear.
" The authors of the Bulwark Anthology will be taking over the Bookworms Anonymous group page on Thursday. We would love to meet you there! Join the gro The authors of the Bulwark Anthology will be taking over the Bookworms Anonymous group page on Thursday. We would love to meet you there! Join the group and check the page throughout the day on Thursday for conversations, games, and giveaways! JOIN HERE ...more "